My shapes are mainly wheel thrown with porcelain clay. I have been working with porcelain clay for a number of years, and find it a remarkably responsive clay. All my porcelain pieces are fired in a high fire gas kiln, and all are functional. On my wheel-thrown work in porcelain I have been using oak wood ash glazes. Wood ash may be the oldest type of glaze. It was discovered by accident in China several thousand years ago. When they were firing their ceramic pieces in their early kilns fueled by wood, some of the ashes from the burning wood traveled from the fire box into the kiln to land on the shoulders of some of the large vases, where they later melted at the higher temperature to form a simple glaze. I like using natural ingredients to make my glazes. 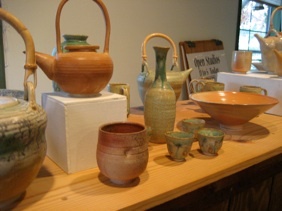 The ash I use is from oak trees, and I fire the ash glaze on my pieces in a gas kiln. I also use clay slips with metallic mineral oxides (iron, copper, rutile) under the ash glaze to add variations to the color. Ash glazes are very fluid and flow down the pot during the firing process. The look of that flow gives ash glazes their distinctive look. My shino glazes receive their color from a reduction firing. The colors range from peach to ivory. One of the distinctive aspects of a shino glaze is “carbon trap.” In this effect some of the smoke in the kiln during the reduction part of the firing is “trapped” in the glaze and leaves a distinctive pattern, the path of the fire through the kiln.